Deliver an axe to the Jarl of Whiterun. Go to Whiterun and give the axe to Jarl Balgruuf the Greater. Ulfric Stormcloak has decided that it's time to make Whiterun's Jarl Balgruuf the Greater pick a side. Ulfric hopes to avoid bloodshed in Whiterun, so he'll give you an axe (Ulfric's War Axe) and tell you to deliver it to Balgruuf. He has no further message for you to take, as he says that the axe is a gesture between two warriors who understand each other and that Balgruuf will know its meaning. When you speak to Jarl Balgruuf, tell him you have a message from Ulfric. Balgruuf will take the axe, but whether or not the quest proceeds depends on if you've already finished Dragon Rising (and its prerequisite quests Before the Storm and Bleak Falls Barrow). If you've already done Dragon Rising then the quest will continue normally; otherwise Balgruuf will hold on to the axe and postpone making a decision about it until Dragon Rising is complete. 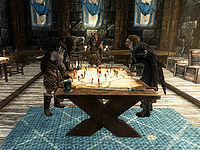 With the time having come to give Ulfric an answer, Balgruuf will discuss the matter with his steward Proventus Avenicci and his housecarl Irileth. Balgruuf will state that he's not entirely happy with Imperial policy, but ultimately he'll decide to side with the Empire. He'll give the axe back to you and begin drafting a letter to negotiate with the Imperial Legion about garrisoning some of their troops in Whiterun. Go back to Windhelm and return the axe to Ulfric. He'll be disappointed in Balgruuf's decision, but Galmar will welcome it; he's ready for battle and eager to launch the assault. After a short conversation, Ulfric will issue orders that initiate the next quest: Battle for Whiterun. If you are on The World-Eater's Eyrie quest and Odahviing is still in Dragonsreach, you will not be able to deliver the axe to Jarl Balgruuf. Completing this quest places Whiterun under siege and makes the city in its normal state unavailable to you until the completion of Battle for Whiterun. Progressing through Message to Whiterun while Season Unending is still open will block progression for both quests. Only stages and objectives relevant to the Stormcloak version of this quest are included in the table. This page was last modified on 24 January 2017, at 05:54.